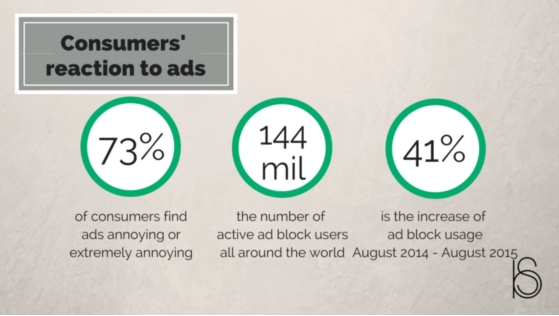 In an era of ad filtering and blocking, brands are resorting to creative channels to break into the promotional noise and get the attention of the readers. These days, the more an advertisement looks like an advertisement, the less effective it will be. This is why brands started to embrace sponsored content to customize their promotions in informative articles to increase their digital marketing effectiveness and return. Sponsored content provides a great opportunity for brands and marketers to reach a highly targeted audience and promote their products and services in a trusting and less invasive environment. In turn, this means more revenue streams for the media outlets. However, this relatively new promotional channel has recently received some criticism regarding its lack of transparency, and the growing mistrust of the readers towards the editorial integrity of media channels who frequently publish sponsored content. In fact, two-thirds of readers have felt deceived upon realizing that an article or video was sponsored by a brand. As a result, marketers are turning to more personalized media, such as bloggers and influencers, to promote their brand and take advantage of native advertising. It is not surprising that traditional advertising’s effectiveness is declining, and consumers are skeptical of brand-created ads and find them highly invasive. With the number of online ads going through the roof, users are becoming ad-blind and if possible they are making every effort to filter and block these ads. Advertisements on the internet and mobile, in particular, are rated the most intrusive and challenging to get rid of. Even Apple is now supporting ad blockage on their latest operating system (IOS 9) which creates some challenges for digital marketers as mobile represents 35% of consumers’ media consumption. As more consumers are finding ways not to see brand-created ads, marketers are making every effort to convey their promotional messages. This has led to the emergence of native advertising where promotional content mimics the normal content of the host website in response to the dwindling effectiveness of conventional digital advertising methods. Through native advertising, marketers can customize their message and target specific audiences who are more likely to engage with the content, and find the content relevant. To dig deeper into this issue, it is helpful to define the ecosystem of native advertising, where ads are camouflaged in the context they appear so the reader thinks they belong there. As consumers are becoming more skeptical of brand-created promotions, marketers are finding new ways to create ads that look like they are created by a third party to give them a more credible perspective. This is how the concept of native advertising appeared in the realm of marketing which is a form of online advertising that matches the context in which it appears and is specifically created for that platform. Native advertising is a form of paid copy-driven promotion where the content is targeted at a certain audience with no clear call-to-action. Its purpose is to inform and educate the readers with less emphasis on making a sale, which makes it a great tool for brands to increase brand awareness and consumer engagement. The main difference between native advertising and other online methods is that it does not disrupt the behavior of the reader as it appears in the normal space of that channel. Based on the 2015 report on native advertising, mobile native advertising offers six times higher conversion rates for brands, compared to traditional banner ads. To ensure transparency and ethical standards, media outlets now have to disclose that a certain content is sponsored, or in other words paid for by brands to enhance informed consumer choices. This factor is reducing the authenticity and effectiveness of such content, thus making native advertising a paradox, as it is not as inconspicuous any longer. The main aspect of native advertising is that it blends in with the editorial content for it to be effective. However, by mentioning that the content is paid for by a brand, the readers may not find it authentic and thus effective, resulting in a huge dilemma for marketers. Based on FTC policies, brands must make every effort to avoid consumer deception when implementing native advertising, and to ensure readers can distinguish between sponsored and editorial comment. These days, people turn to their peers to inform their purchasing decisions. The growth and popularity of social media have led to the birth of product-savvy individuals, or in other terms bloggers, who constantly share their personal opinions and experiences with products and services in real settings with other consumers. Reported in a recent survey by Research Now, 84% of consumers make a purchase based on a blog post. Bloggers are content curators and tastemakers who have built a unified and highly targeted network via social media and have great influence over this network. They enjoy a high degree of trust from their readers because if a product does not fit their niche they are unlikely to promote it as they would risk losing their authority and engagement. Bloggers have more influence over consumers compared to big media outlets, because they take advantage of their human touch, their authenticity, and the reader’s’ higher engagement level with their content. To cut through the promotional noise, companies are now turning to bloggers with high social influence to get their word out. Regardless of the transparency controversy of native advertising, blogs are the most effective channels for brands to promote their sponsored content. 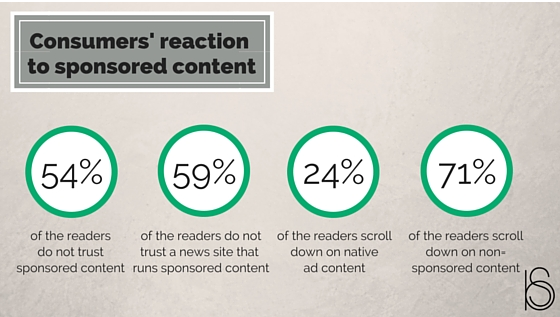 In fact, sponsored blog posts are the most popular (65%) type of native advertising. The most prominent asset of blogs over other media channels, which makes them more compelling is that readers actively seek them out to learn more about existing products and services, unlike other media channels whose primary function is to distribute news. Readers not only find sponsored content on blogs unobtrusive, but this is, in fact, the type of content they are expecting from these channels. Due to the skyrocketing number of ads and their intrusive nature, consumers mistrust and dislike content promotions by brands more than ever. To influence people’s shopping habits, marketers have been turning to native ads, especially sponsored content, to gain consumers’ attention and dress their ads in informative articles. Marketers are collaborating with bloggers and influencers to take advantage of native advertising in a trusting environment. Readers find bloggers more authentic and credible than media outlets because they are consumers themselves and are more likely than a company, whose primary goal is to make money, to share their honest opinions. Leveraging on the influence of bloggers can be a great tool for marketers as they can reach a highly targeted and relevant audience who actively seek their content to gather more information about products and services.